Now that the big day is over I can show you a few things that I made. 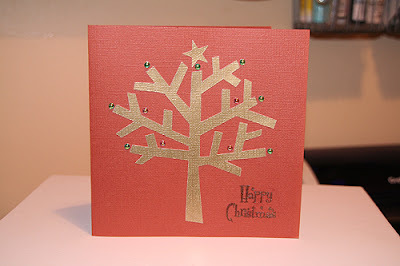 This was the first time that I had ever made any Christmas cards (I am so not a card maker!) but I was quite pleased with how these turned out. I used Katie Pertiets Holiday Trees digital brush set to create a template for the Craft Robo, and then cut the trees out of metallic cardstock and embellished them with some lovely shiny pearls using my bejeweller. 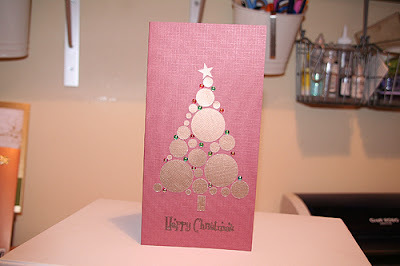 I then stamped the Christmas greeting using some little stamps from the Banana Frog Retro Baubles set, and embossed it. 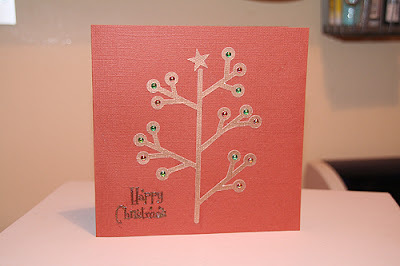 I used some Basic Grey Figgy Pudding on one of the cards too... I also made two Birthday Books for my Mum and sister. I used a calendar template from the web and prettied it up with a nice font and some cool brushes, then created a little birthday listing too. 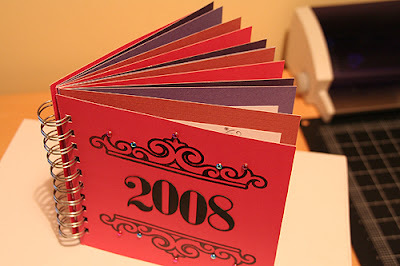 Put them all together as a 6x6 book with the Bind It All, and then stamped and embossed the front cover, added the 2008 cut from black card on the Craft Robo, and a few bits of bling on each! Yes, you may have spotted that Day 10 is missing - the reason is that I still haven't bought any wrapping paper, and as Day 10 is about wrapping gifts it will have to wait! I have also been trying to make the pages a lot simpler as I was sat here till gone midnight on a couple of occasions trying to make a fantastic page, and then I got a grip and realised that I was just making work for myself! 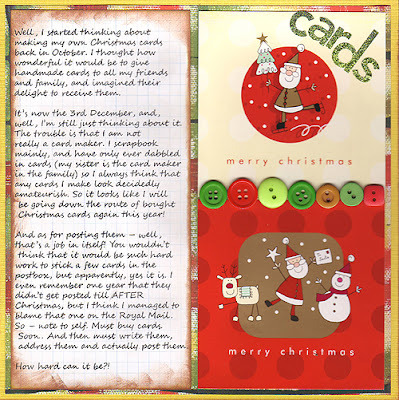 Day 8 and 9 of the Christmas Journal - I am caught up now! 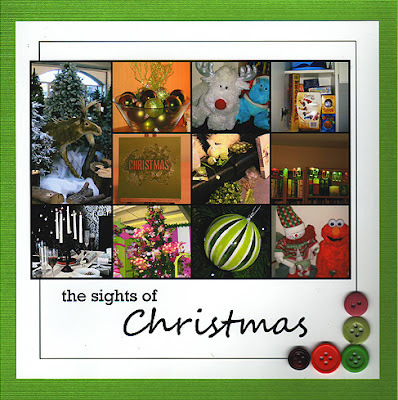 Day 8 was purely photos - I used a template by Jen Caputo and then printed it out and fixed to cardstock, with a few buttons added on. Tradition No.1 We always open our presents as soon as we wake up! Every year, no matter how much I say I am going to have a lie in, I am always awake by about 7am, and then we make a nice cup of tea and sit down stairs opening our pressies. We take it in turns to open presents – one for me, then one for you! And we each pick which one the other has to open next! Tradition No.2We always, always have a tree (although there have been some years where I didn’t want to – Ste always talked me round!). We also seem to have caught the Christmas light bug, we have bought quite a few to add to the collection this year! I love decorating the outside of the house too. We said that we were going to buy something new to add to the outside of the house of the house every year and we seem to be keeping up with that so far! 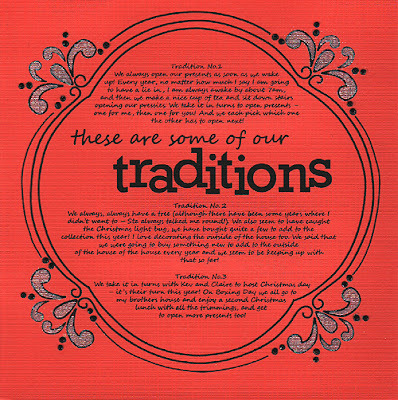 Tradition No.3 We take it in turns with Kev and Claire to host Christmas day – it’s their turn this year! On Boxing Day we all go to my brothers house and enjoy a second Christmas lunch with all the trimmings, and get to open more presents too! Shopping. In theory - I love it! 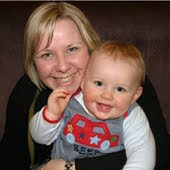 Am quite fond of shopping in general, but going out and buying lots of lovely gifts for people - fab! In practice - Oh deary me. The Trafford Centre in December is NOT a pleasant place to be! Particularly when it is the 7th December, I haven't bought any pressies yet and nobody will tell me what they want! 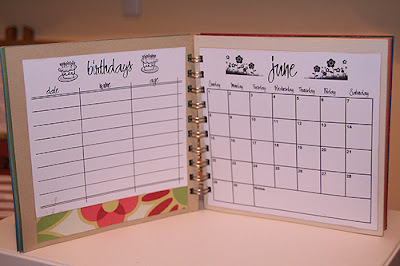 Organised, moi? Nope, you must be thinking of somebody else! I didn't miss a day! I just didn't have chance to upload it, so I will play catch up today and show you day 5 and day 6. 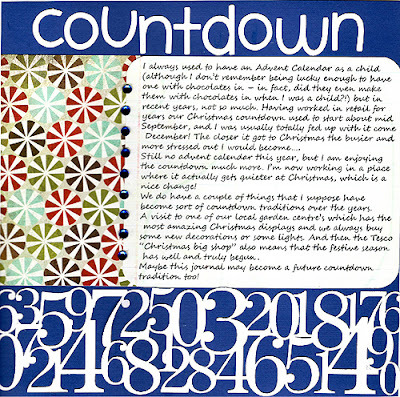 Day 5's prompt was about Advent calendars and counting down to Christmas. I used some BG Figgy Pudding and some crystals, the numbers and the title were cut on the Craft Robo. I always used to have an Advent Calendar as a child (although I don’t remember being lucky enough to have one with chocolates in – in fact, did they even make them with chocolates in when I was a child?!) but in recent years, not so much. Having worked in retail for years our Christmas countdown used to start about mid September, and I was usually totally fed up with it come December! 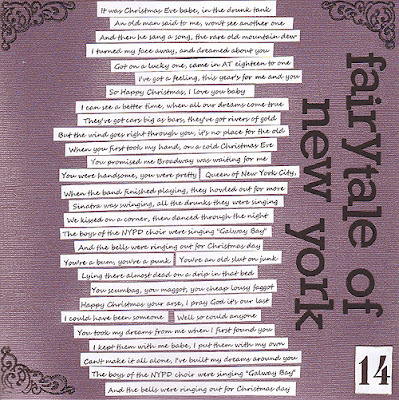 The closer it got to Christmas the busier and more stressed out I would become…. Still no advent calendar this year, but I am enjoying the countdown much more. I’m now working in a place where it actually gets quieter at Christmas, which is a nice change! We do have a couple of things that I suppose have become sort of countdown traditions over the years. A visit to one of our local garden centre’s which has the most amazing Christmas displays and we always buy some new decorations or some lights. And then the Tesco “Christmas big shop” also means that the festive season has well and truly begun. 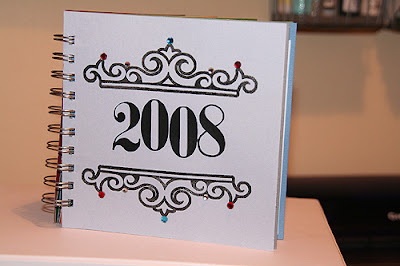 Maybe this journal may become a future countdown tradition too! 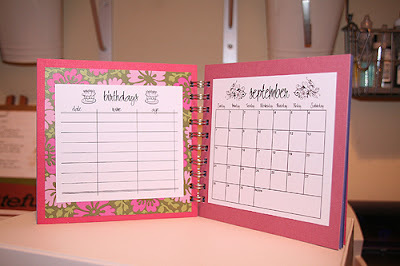 The cards with the journalling on pull out from behind the scalloped card. The good - I remember when I was a child, waking up really early, and calling out “Is it time to get up yet?” Eventually we were allowed out of bed, and had to wait at the bottom of the stairs for Mum and Dad to come down before we were allowed into the living room to open our pressies! They were always arranged in 3 big piles for me, my brother and sister, and we fell on them and started tearing off wrapping paper in our haste to get to the toys inside! Then, later in the day we had even more presents when we would exchange gifts from under the tree - I was always Santa's Little Helper, giving the presents out round the room! Every Christmas since I met my husband has also been amazing! We still wake up really early on Christmas morning, giggling like schoolchildren and saying “Do you think he has been yet?” before going downstairs to open our pressies! And the not so good - I can’t quite remember the year…I think I was 21 or 22? I had just started working as a relief manager for the licensed trade and was in my first ever posting. This particular pub had just changed over from tenancy to be part of the managed house estate and was very much a “locals” pub. I took over about the second week in December, I knew that the pub was going to be open for Christmas Day lunch, but we had a chef, so that was OK. Christmas Eve I came downstairs to find a note through the back door – the chef had quit! Aaaargh! I rang my area manager, who in his infinite wisdom decided that I could manage to cook a 3 course Christmas lunch for 40 people on my own. I just about struggled through, but I vividly remember peeling sprouts till gone midnight on Christmas Eve, and ringing my dad on Christmas morning to enquire how to cook roast potatoes! 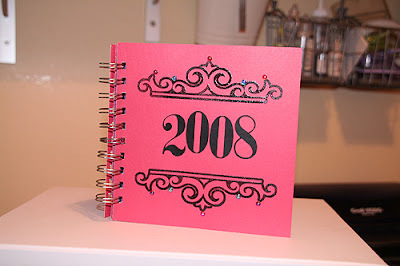 I still shudder when I think about it….it was not a good year! I thought I wasn't going to manage this today (I nearly didn't! Look at the time, its 20 past midnight!). We decided to go and do our Christmas "big shop" at Tesco tonight, it was all a bit spur of the moment cos we had nothing in for tea! Spent rather a lot, but at least we have plenty of food (and chocolate!) in the house now. Todays prompt was about your perfect Christmas. I only managed a really simple page today, I didn't really have time for anything else! The challenge was also to include a photo or drawing, so I went for some hand drawn doodles round the border of the page. 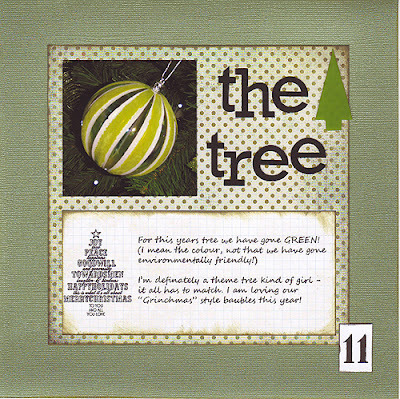 The tree is from a digital kit by Sandy Krieger, printed onto white cardstock and cut out, with a teeny little crystal in the centre of the star. 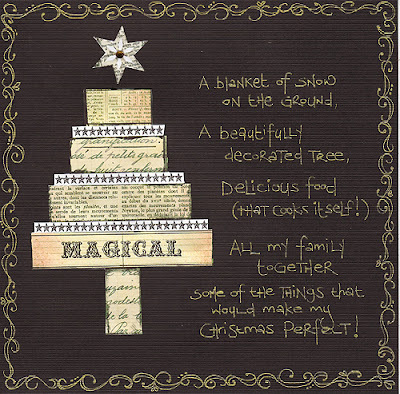 A blanket of snow on the ground, a beautifully decorated tree, delicious food (that cooks itself! ), all my family together. Just some of the things that would make my Christmas perfect! Well, I started thinking about making my own Christmas cards back in October. I thought how wonderful it would be to give handmade cards to all my friends and family, and imagined their delight to receive them. It’s now the 3rd December, and, well, I’m still just thinking about it. The trouble is that I am not really a card maker. I scrapbook mainly, and have only ever dabbled in cards (my sister is the card maker in the family) so I always think that any cards I make look decidedly amateurish. 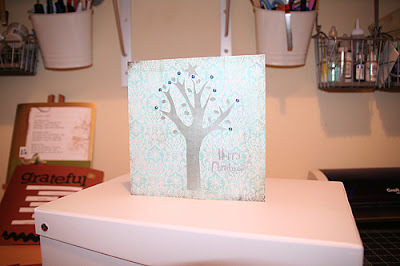 So it looks like I will be going down the route of bought Christmas cards again this year! And as for posting them – well, that’s a job in itself! You wouldn’t think that it would be such hard work to stick a few cards in the postbox, but apparently, yes it is. I even remember one year that they didn’t get posted till AFTER Christmas, but I think I managed to blame that one on the Royal Mail. So – note to self. Must buy cards. Soon. And then must write them, address them and actually post them. How hard can it be?! Thank you for the lovely comments over the last few days too! 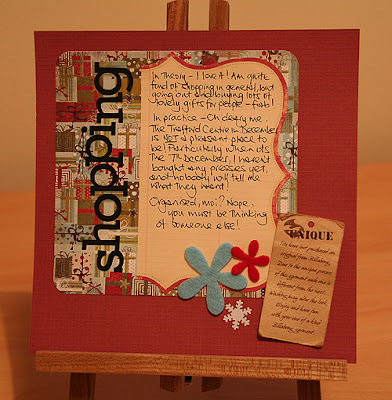 Two blog posts in two days? Surely the internet will collapse from the shock! 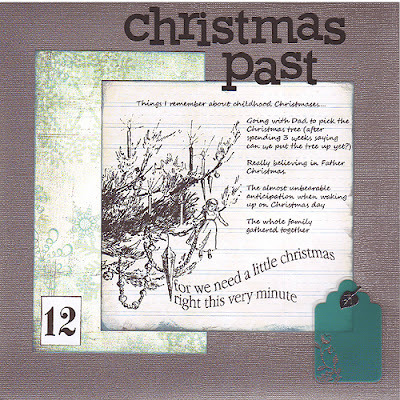 Here's my journal entry for day 2 - again, I created the notebook page in Photoshop with Katie Pertiet's lined notepaper, and used some more Figgy Pudding. The title and large snowflakes were cut out on the craft robo and inked, then I got to work with my bejeweller too! 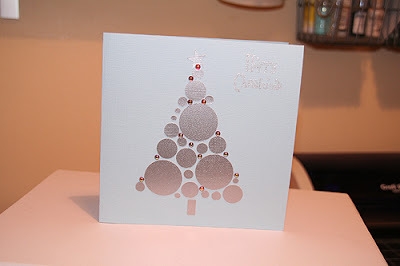 The little silver snowflakes were done with a stamp from Banana Frogs Retro Baubles set. Still, I can’t deny, I think I would find it a bit odd to be warm at Christmas! As much as the idea of lazing round a pool, sipping cocktails on Christmas Day might appeal to me, in reality the weather helps to make the season what it is. The cold, crisp days, when the sky is a brilliant shade of blue, and you can see the frost on the trees, these are the days when the best thing to do is snuggle up on the settee watching a good film on the TV with a nice mug of hot chocolate. And the snow! When you wake up in the morning, and you can immediately tell from the quality of light through the bedroom curtains that snow has fallen overnight. Peeping through the curtains and seeing the perfect blanket of snow lying on the ground early in the morning, before anybody has walked on it and cars have turned it to slush is definitely a magical moment! Of course, two hours later, when I am trying to get to work through the traffic chaos that the slightest bit of snow causes in this country, and I am cold, and wet, and my boots are ruined…..well, it does lose a bit of the magic then if I’m being honest. But first thing in the morning? Perfect….. I have signed up for Shimelles "Journal Your Christmas" online class this year - I thought I might have some time to do it as I'm no longer working in retail, and I might actually enjoy Christmas this time round! Anyway, here it is. 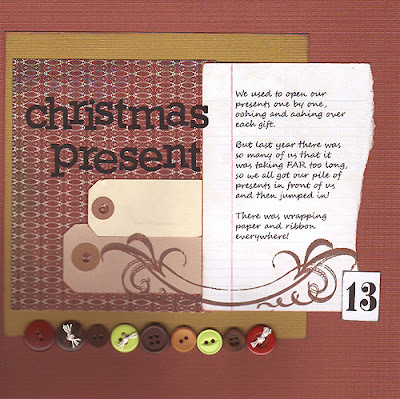 I created the notebook page in Photoshop, useing Katie Pertiet lined notebook paper, and Rhonna Farrer Christmas Brushes, then printed it off and attached to 8x8 cardstock. I then used some BG Figgy Pudding around the edges, and lots of ink! I can't help but think it needs a bit of something else, but I am going to leave it as it is for now. 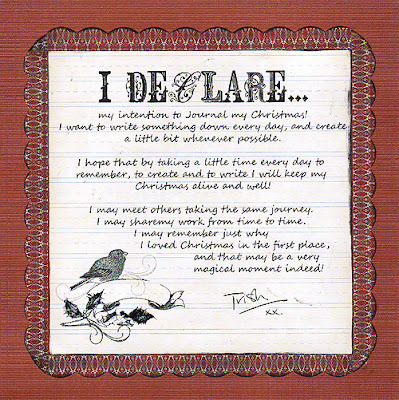 Text reads - I declare my intention to Journal my Christmas! 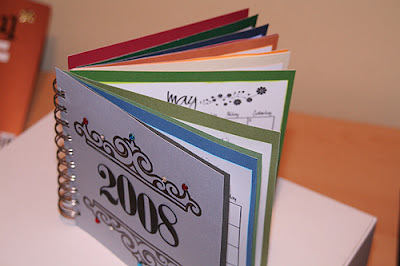 I want to write something down every day, and create a little bit whenever possible. 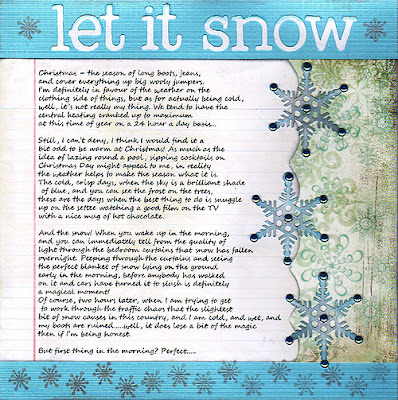 I hope that by taking a little time every day to remember, to creat and to write I will keep my Christmas alive and well! I may meet others taking the same journey. I may share my work from time to time. I may remember just why I loved Christmas in the first place, and that may be a very magical moment indeed!